Marinobacter sp. (MSI032) isolated from the marine sponge Dendrilla nigra was optimized for the production of extracellular cellulolytic enzyme (CMCase) by submerged fermentation. 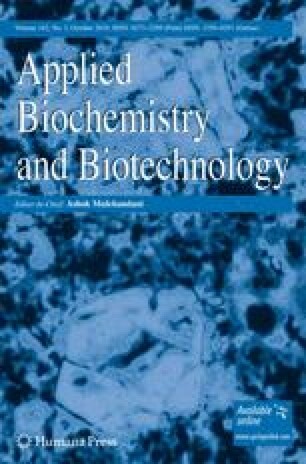 Initial experiments showed that the culture medium containing 1% maltose as carbon source and 1% peptone and casein as nitrogen source supported maximal enzyme production at 27 °C and at a pH of 9.0. Further optimization carried out showed the maximal enzyme production was supported by the presence of 2% NaCl and 10 mM Zn2+ ions in the production media. The production of enzyme cellulase occurred at 48 h of incubation which proved the importance of this strain for cellulase production in large scale. Further, the enzyme was purified to 12.5-fold with a 37% yield and a specific activity of 2,548.75 U/mg. The purified enzyme displayed maximum activity at mesophilic temperature (27–35 °C) and at a broad pH range with optimal activity at pH 9.0. The purified enzyme was stable even at a higher alkaline pH of 12.0 which is greater than the pH stability that has not been reported in any of the cellulolytic isolates studied so far. Thus, from the present study, it is crucial that, instead of exploring the thermophilic resource that is limited in natural environments, the mesophilic bacteria that occurs commonly in nature can be added up to the database of cellulolytic bacteria. Thus, it is possible that a wide diversity of mesophilic bacteria associated with marine sponges opens up a new doorstep for the degradation of cellulosic waste material for the production of liquid fuels. This is the first report elucidating the prospects of sponge-associated marine bacterium for the production of extracellular alkaline cellulase.